A man looking through produce at a Long Beach farmers market. Photo by Stephanie Rivera. In an effort to expand its fresh food recovery program further south from its headquarters in North Hollywood, Food Forward has announced it’s opening up shop in Long Beach next month, where it will solicit donations of fresh produce from area farmer’s markets, which will then pass the food on to people in need. Started in 2009, the group gleans leftover fresh produce from farmers markets, in addition to collection efforts from grocery stores and even sources located in residential lots to reduce waste, but also to provide access to communities that might otherwise be unable to afford it. Since its inception, Food Forward has recovered over 20.5 million pounds of food, according to the group. 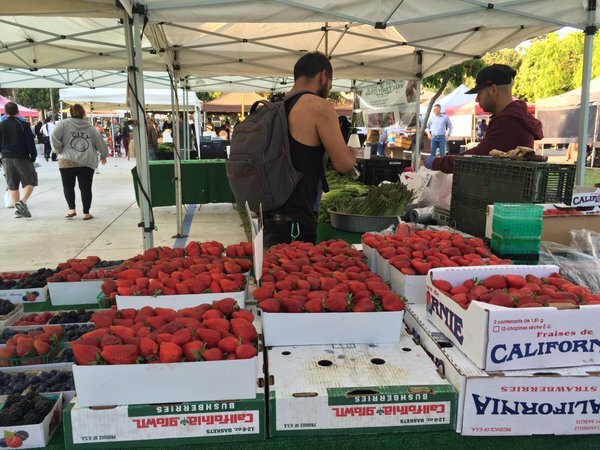 Leah Boyer, a Long Beach resident and the group’s farmers market recovery manager, said she knew the need existed in Long Beach, but it was just a matter of finding a willing partner to link up with to begin a gleaning program. That partner will be the Sunday farmers market located at the Marina Pacifica, where the group will set up its operation in mid-August. 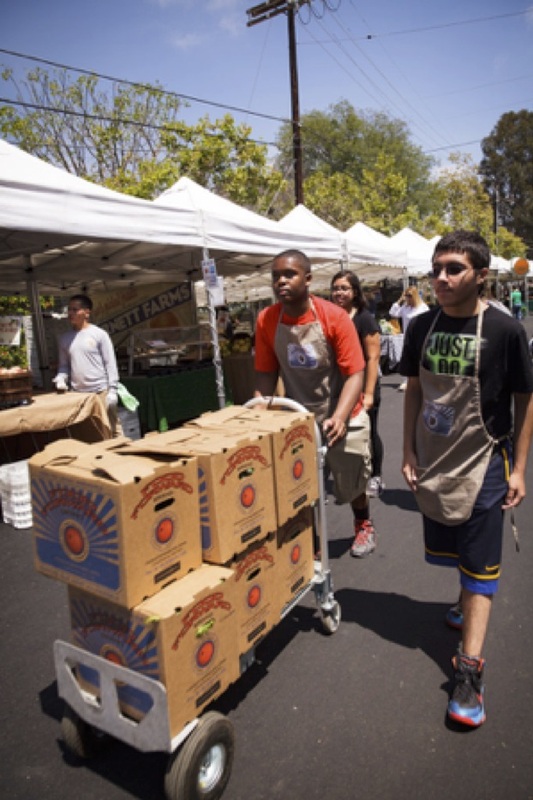 The group will dispatch volunteers with collection boxes to the weekly market where it hopes to establish the same kind of presence it has in other Los Angeles outlets, where it averages nearly 550 pounds per yield for small markets and upward of 2,000 pounds per week for larger market. In June alone, the group saved nearly 60,000 pounds of fresh food from local markets, all of which was donated to local food banks for distribution. The group will partner with Food Finders, a similar outlet that helps distribute food to needy communities and the Christian Outreach In Action, a nondenominational non-profit that has served the community for the past 32 years and touts itself as the only organization in the city that serves hot meals seven days a week. Getting fresh produce into the pantries of institutions like these and thus into the hands of those who need access to fresh food is important. Boyer said it’s equally important to make sure the food is distributed in a timely manner. The group’s policy stipulates that it’s partner organizations, which distribute the produce, must use it within three days of receipt, something that has resulted in some groups changing their donation days so they can be part of the program. The waste of fresh food is a problem both nationally and worldwide. Last week, The Guardian released data it compiled that illustrated this problem to the tune of 60 metric tons of edible food wasted in the US annually, the equivalent of about $160 billion or 50 percent of all produce grown in the country. The piece focused more on the perception that “non-perfect” produce was less edible and thus less salable, leading to the massive amounts of waste. Food waste is also estimated to contribute more to climate change than India or Russia, due to the breakdown of produce, which creates methane, a much more potent greenhouse gas than carbon dioxide. Foods collected by groups like Food Forward could inevitably meet the same fate if they were not donated by willing farmers before their shelf-lives expired. The program is 100 percent optional for farmers to participate in and those who do are able to write off their donations on their tax returns. The group said that at the 18 markets in which it currently operates, it averages a participation rate of about 75 percent, a mark it’s officials are optimistic it will eventually reach in Long Beach.